The second Toronto Sailor Moon Celebration will be taking place next month, on July 9th, at the Ontario Science Center. This year has some great guests in store yet again. Voice actors Vince Corazza, the voice of Alan Granger and the third voice of Tuxedo Mask, will be there. Tony Daniels, the voice of Jadeite, will be making his second appearance at the convention. Jennifer Cihi, who provided the vocals for many songs in the original English dub of Sailor Moon, will be there to perform a concert. Fan Fiction The Show, who have previously done comedy shows in Toronto about Sailor Moon and other fandoms, will be putting on a live comedy performance at the convention. There will also be a lot of Cosplay guests including Yume and Kitsurie from Cosmeko, Jelly Cosplay, and Ammie Cosplay. I met Cosmeko at Unplugged Expo a couple of years ago and they had some great tips for making Sailor Moon costumes and accessories. 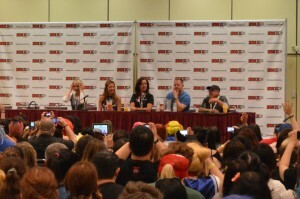 I had a great time at the Toronto Sailor Moon Celebration last year and even had a chance to participate in a few of the panels. Unfortunately I won’t be able to make the trip to Toronto this year. For more details check out the event’s Facebook page, official web site or Moon Chase. You can also read the press release below for details on everything planned at this event. This weekend, June 3rd to the 5th, is Villains Con at the David S. Palmer arena in Danville, Illinois. The convention will feature Jennifer Cihi, who provided the vocals for a number of songs from the English dub of the original Sailor Moon anime, and Lauren Landa, the new voice of Sailor Neptune for Viz’s new dub of the original Sailor Moon anime and Sailor Moon Crystal. There’s a lot going on throughout the next month for Jennifer Cihi, the singer who performed many songs for the original English dub of the Sailor Moon anime. She’s be giving performance classes in Nashville June 16th to the 18th, appearing at My Animix in Kenosha, Wisconsin on June 20th and performing with iconiQ, the Soundtrack Orchestra, for SERASYMPHONY in Los Angeles on July 5th. Aspiring singers and actors will want to check out Jennifer Cihi’s Theatre Master Class in Nashville, Texas from June 16th to the 18th. The courses will take place on weekday evenings from 5:30pm to 8:30pm Central Time at The Arts at Center Street. You can send an e-mail to booksailormoon@gmail.com to register. Sailor Moon fans in the Chicago and Milwaukee area should check out My Animix in Kenosha Saturday June 20th. My Animix is a sort of anime club and store. Jennifer Cihi will be making an appearance from 4pm to 7pm Central Time. Los Angeles area Sailor Moon fans can catch Jennifer Cihi performing with iconiQ, The Soundtrack Orchestra, for SERASYMPHONY. This concert will take place on Sunday July 5th at 8pm Pacific Time at the Colburn School in Los Angeles. Although Jennifer Cihi provided the singing voice for many dubbed Sailor Moon songs, SERASYMPHONY also features a lot of music from the original Japanese version of Sailor Moon. Tickets are $30 and can be purchased from the SERASYMPHONY site. Check out the video embedded below for a preview of what SERASYMPHONY has to offer. Jennifer Cihi, who is credited as the singing voice of Sailor Moon, appears in a number of songs played throughout the original DiC dub of the Sailor Moon anime. On the three Sailor Moon soundtracks her name is credited as Sailor Moon, Princess Serena and Sailor Mars. She has provided the vocals for “I Wanna Be A Star!”, “My Only Love”, “Carry On”, “It’s A New Day”, “Call My Name”, “The Power of Love”, “I Want Someone to Love”, “I Want to Hold Your Hand” and “Who Do You Think You Are?”. Jennifer Cihi, a singer who performed many songs for the original English dub of Sailor Moon, will be making an appearance at JABEcon this coming Saturday at Cumberland University in Lebanon, Tennessee, not far from Nashville. Often credited as the singing voice of Sailor Moon, Jennifer Cihi’s voice was heard in the series and on the three soundtracks that were made for the show. A quick look at the JABEcon schedule shows Jennifer Cihi appearing at two panels, held at 10:30am and 1pm. Learn the ins and outs of singing in Anime, Music City, and much more with guest Jennifer Cihi (Singing Voice of Sailor Moon, Princess Mononoke, and an accomplished singer in Music City). Join Jennifer Cihi (The singing voice of Sailor Moon) as we travel back to the 1990s when Sailor Moon was singing her way to pop culture and talk about the hit show’s impact. 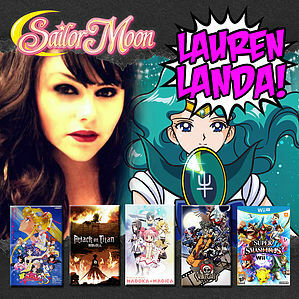 Bring your Sailor Moon cosplay and Q&A for a chance to win a cool prize! On Sailor Moon soundtracks Jennifer Cihi is credited as Sailor Moon, Princess Serena and Sailor Mars. She provided the vocals for “I Wanna Be A Star!”, “My Only Love”, “Carry On”, “It’s A New Day”, “Call My Name”, “The Power of Love”, “I Want Someone to Love”, “I Want to Hold Your Hand” and “Who Do You Think You Are?”. Jersey City and New York City Sailor Moon fans may be able to see Jennifer Cihi, who performed many songs for the original English version of Sailor Moon, perform at Gundam Planet in New Jersey. She will be in the area but will only be able to hold a performance if there is enough interest to support it. The event is tentatively scheduled for July 17th. Respond to this Facebook event to show your interest. Jennifer Cihi, a singer who performed a number of songs for the original English dub of the Sailor Moon anime, will be making an appearance at Anime Zakka, a comic book shop in downtown Boston, on February 20th. Details posted on the Sailor Moon News Facebook Page mention that this free event will be an opportunity to listen to Sailor Moon songs, get an autograph, chat and more. Anime Zakka has two locations in Boston. This event will be taking place at the location at 350 Newbury Street on Friday February 20th from 5 to 7pm. Jennifer Cihi, often credited as being the singing voice of Sailor Moon, appears in a number of songs played throughout the series as well as on the three soundtracks which have been released. Her name is credited as Sailor Moon, Princess Serena and Sailor Mars as she has done the vocals for “I Wanna Be A Star!”, “My Only Love”, “Carry On”, “It’s A New Day”, “Call My Name”, “The Power of Love”, “I Want Someone to Love”, “I Want to Hold Your Hand” and “Who Do You Think You Are?”. These CDs are out of print. You can buy them from resellers on Amazon using the links below. Many songs are also available on iTunes. The cast of Sailor Moon will be in Europe for the first time! This Halloween weekend, October 31st to Novemeber 2nd 2014, Linda Ballantyne, the voice of Sailor Moon, Toby Proctor, the voice of Tuxedo Mask, Katie Griffin, the voice of Sailor Mars, Susan Roman, the voice of Sailor Jupiter, and Jennifer Cihi, singer for many song from the DiC dub, will be appearing at MaltaComics Expo in Valletta, Malta. Jennifer Cihi is often referred to as the singing voice of Sailor Moon as she is credited as Sailor Moon, Princess Serena and Sailor Mars on tracks of the Sailor Moon: Songs From the Hit TV Series and Lunarock albums. Though Sailor Moon never actually sang in the English dub many of the songs she provided the voice for had a narrative that presented them as the voice of Sailor Moon. During the original 65 dubbed episodes she sang “I Wanna Be A Star!” from the episode “So You Want to Be a Superstar”, “My Only Love” from when Princess Serena is revealed in “A Crystal Clear Destiny”, “Carry On” which plays during the fight with Beryl and “It’s A New Day” which plays when Serena wakes up after that same fight in “Day of Destiny” and “Call My Name” which is sung by Raye at the Autumn festival during “Raye’s Day in the Spotlight”. Jennifer Cihi returned to sing on the second soundtrack, providing the vocals for “The Power of Love” which played during the battle with Wiseman in “Final Battle”, “I Want Someone to Love”, “I Want to Hold Your Hand” and “Who Do You Think You Are?”. An announcement on the Anime Expo web site tells us that Jennifer Cihi, the singer who performed many of the songs for the English dub of Sailor Moon, will be performing at the convention in Los Angeles July 3rd to the 6th. 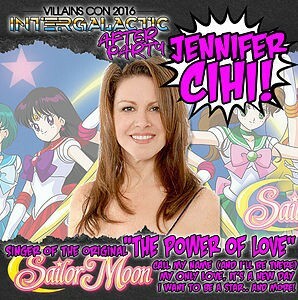 Jennifer Cihi joins Viz and many voice actors for the weekend which will include Sailor Moon Day, July 5th, which is the day the new Sailor Moon anime’s first episode will be released. Jennifer Cihi, who performed the songs I Wanna Be A Star, My Only Love, Call My Name, It’s a New Day, Carry On, I Want Someone to Love, I Want to Hold Your Hand, The Power Of Love and Who Do You Think You Are? will be performing in the opening ceremonies, in Lounge 21 and will be holding autograph sessions. Viz Media’s press release details all that they have planned for the weekend. Saturday July 5th is Sailor Moon Day when most of the events are planned. Starting at 10am is Viz’s Sailor Moon Official Panel where the first two episodes of Viz’s new English dub of Sailor Moon will be premiered. The cast will be revealed for the first time and will be there to answer questions. Attendees also will be able to pick up a premium poster. At 1pm an autograph session for the voice actors from Viz’s new Sailor Moon dub will be taking place in the autograph area. At 2:45pm at Viz Media’s booth, 1601, there will be a photo op with the new voice cast and the official Sailor Guardian Cosplayers from American Cosplay Paradise. At 3:30pm there will be a gathering of Sailor Moon cosplayers in the main events hall. Viz will also be offering a limited premiere event memorial coin at the convention. In addition to the new Sailor Moon voice cast the original Sailor Moon English DiC/Cloverway voice cast will also be in attendence. As we posted about back in January, the convention will also be playing host to Linda Ballantyne, Sailor Moon, Karen Bernstein, Sailor Mercury, Katie Griffin, Sailor Mars, Susan Roman, Sailor Jupiter, Stephanie Morgenstern, Sailor Venus, Toby Proctor, Tuxedo Mask, Mary Long who voice Molly, Catsy and JunJun, Ron Rubin, Artemis and John Stocker, voice director for the movies and final two seasons. Linda Ballantyne has mentioned via twitter that the original cast autograph session will be at 12:15pm on Friday July 4th with their panel at 3:00pm. 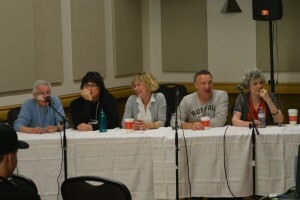 It is not yet clear what voice actors, if any, will be reprising their role in the new dub or what new voice actors may be making appearences at the convention.